In 2017, more than 70% of the total digital textile printing market was dominated by the roll to roll printing process. Roll to roll digital printers are majorly used in textile and decor, soft signage, and industrial applications. Applications of DTP (Digital Textile Printing) technology segmented into four major categories, namely textiles, clothing, home textiles, soft signage, and others. Textiles and clothing application is projected to see fastest growth with a CAGR of 29.4% in terms of volume, from 2015-2020. According to the new market research report on the “Digital Textile Printing Market by Printing Process (Roll to Roll, DTG), Ink Type (Sublimation, Pigment, Reactive, Acid), Application (Textile & Decor, Industrial, Soft Signage, Direct to Garment), and Geography – Global Forecast to 2023” market is expected to be worth USD 2.31 Billion by 2023 from USD 1.76 Billion in 2018, at a CAGR of 5.59% between 2018 and 2023. The market for direct to garment application is expected to grow significantly because of fast moving fashion cycles, cost advantage on short run cycles, creative designs, quick time to market for new trends, reduced wastage, and low power consumption are some of the major factors which will drive the market for direct to garment applications. The global digital textile printing market for roll to roll printing process held the largest share in 2017. In fact, in 2017, more than 70% of the total digital textile printing market was dominated by the roll to roll printing process. Roll to roll digital printers are majorly used in textile and decor, soft signage, and industrial applications. The major applications in textile and decor are home textile, upholstery, linens, drapery, ties, sportswear, footwear, clothes, interior decor, etc. Applications in the soft signage and industrial segments include carpets, posters, banners, flags, vehicle wrapping, wallpaper, building material, POS display, etc. Soft Signage application is the oldest and largest end-use application of the DTP technology. This segment represents roughly 44.1% of the market size in 2014 in terms of volume and is expected to be the second fastest growing market till 2020 growing at a CAGR of 27.7% in terms of volume. the digital textile printing industry include the growing demand for sustainable printing; increasing demand for digital textile printing in the garment and advertising industries; shortening lifespan and faster adaptability of fashion designs; development of new technologies in the textile industry; reduced per unit cost of printing with digital printers, and growth of the e-commerce industry. DTP can significantly lower time to market as compared to traditional printing methods and reduces inventory obsolesces. Traditional textiles printing process takes around 6-8 weeks against 3-10 days taken by DTP. DTP helps textiles printers to eliminate the unnecessary steps and reduce the time in order to stay competitive in the fast changing fashion cycles which has also reduced the average run lengths across all the regions. DTP is also more environment friendly process consuming less power and water and leaving minimal industrial waste and CO2 emission as compared to traditional printing process, which makes it an ideal choice for the replacement of the traditional printing process taking into consideration its environmental impacts. Traditional textiles printing process takes around 6-8 weeks against 3-10 days taken by DTP. DTP helps textiles printers to eliminate the unnecessary steps and reduce the time in order to stay competitive in the fast changing fashion cycles which has also reduced the average run lengths across all the regions. Europe is the largest regional segment using DTP technology led by Italy. The region accounted for 47.4% and 46.4% of the global DTP output in 2014, respectively in terms of volume and value. The region was followed by Asia-Pacific, North America and RoW with a respective market share of 26.7%, 15.7% and 10.3% in 2014 in terms of volume. Digitally printed textiles output was around 563.2 mm2 worth $853.8 million in 2014. Digitally printed textiles output is estimated to grow at a CAGR of 28.1% in terms of volume to reach 2,519.7 mm2 worth $4,260.0 million by 2020. Asia-Pacific region led by India is expected to register the fastest growth amongst all the regions across all the regions. DTP output in this regional segment is expected to grow at a CAGR of 33.0% and 35.7%, in terms of volume and value between 2015 and 2020. Disperse and sublimation ink which is primarily used for soft signage printing applications represents the largest market share amongst all the ink types, this segment accounted for roughly 58.7% and 57.4% of the market size in 2014 in terms of volume and value. Pigment ink segment, which accounted for 2.5% of the market share in 2014 is expected to be the fastest growing ink segment and is expected to grow with a CAGR of 33.8% in terms of volume, from 2015-2020. The digital textile printing market comprises business entities such as Aeoon Technologies GmbH (Austria), ATPColor Srl (Italy), Bordeaux Digital PrintInk Ltd. (Israel), Durst Phototechnik AG (Italy), Hollanders Printing Systems B.V. (Netherlands), Kornit Digital (Israel), SPGPrints B.V. (Netherlands), Brother International Corporation (Japan), Colorjet Group (India), d.gen Inc. (South Korea), Konica Minolta, Inc. (Japan), Mimaki Engineering Co., Ltd. (Japan), Mutoh Holdings Co. Ltd. (Japan), Ricoh Company Ltd (Japan), Roland DG Corporation (Japan), Seiko Epson Corporation (Japan), DuPont (US), Electronics For Imaging, Inc. (US), and Huntsman International LLC (US). “Digital textile printing has been developing rapidly in Indian market over the past several years and with this development the demand for high speed and stable printing machine is escalating. It was observed that the demand for printer with speed of 200 to 500 sq.mtr./hr was increasing. Apsom Technologies which has been offering medium speed machine from 30 to 60 sq.mtr./hr. 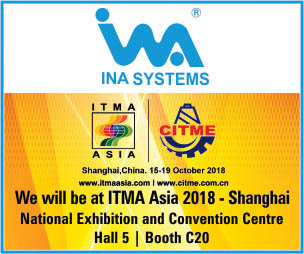 so far did not had presence in high speed machines, however, at ITMA 2015, Konica Minolta launched high speed printing machines such as Nassenger 8, Nassenger 10 & Single Pass SP-1 printer range. Before Apsom Technologies entered high speed segment, this sector mainly comprised of printers with Kyocera print heads, but with the entrance of Konica Minolta machines, Apsom Technologies successfully installed several machines in Mumbai, Surat and New Delhi. “We have received a very good response for our machines in fact because of the stability and performance of machines customers have placed repeat orders of Nassenger 8 or upgraded themselves to Nassenger 10, said Vir Vikram Bhatia, MD, Apsom Technologies. The most important and favourable point for Apsom Technologies and Konica Minolta has been that all the major components such as printer, print heads and inks all are form Konica Minolta which enables user to have high quality, stable and achieve repeatability with ease. “Customers were initially skeptical about the ink cost but when they used the machine and experienced the low consumption of ink, minimal wastage, low or no downtime of machine and excellent running on various fabrics, they were prompted to reinforce their faith by placing repeat orders,” averred Bhatia. After sales customer support has been the key from Apsom Technologies and is a single contact window for any type of queries of issues in the machine. With the installation of Konica Minolta Nassenger PRO 60, PRO 120, Nassenger 8 and Nassenger 10, Apsom Technologies is looking forward to install first SP-1 in Indian market. Mumbai based DCC Print Vision that offers solution for digital textile print market in collaboration with EPSON launched Monna Lisa Evo-Tre, a remarkable digital textile inkjet printer in Indian market to cater various printing requirement of the industry. Monna Lisa Evo Tre has revolutionised the textile market by offering a digital tool that could shift from the sampling phase to reliable industrial production. The Monna Lisa is an industrial inkjet digital textile printer jointly developed by Epson and the leading Italian textile manufacturing equipment manufacturer Robustelli s.r.l. Epson provided Robustelli with inkjet technology such as Micro Piezo print heads and ink supply mechanism components, enabling the two companies to commercialise a digital textile printer that can handle volume printing. With the flexibility to print on a range of fabrics including silk, cotton, nylon and polyester the machine offers high quality mode (1200 dpi – 4 pass), it achieves high-speed printing of about 147 metres square/hour with 32 print head model.Monna Lisa Evo Tre 16 print head model offers high speed of 63 m²/hr with high resolution printing (1200 dpi – 6 pass) and with the robustness to operate around the clock, it offers high productivity for volume printing. With the machine it is possible to streamline sampling and prototyping production at a drastically reduced cost and with the best quality. 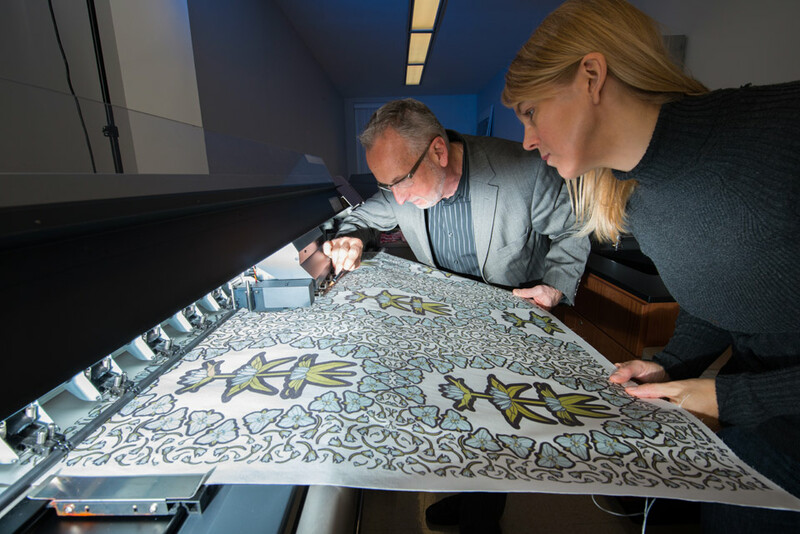 Lower energy and water consumption make it a cutting-edge printer in the extraordinary evolution of printing technologies used in the textile industry. Electronics For Imaging, Inc. continues to revolutionise the future of printing by introducing new technologies with its next-generation hybrid flatbed/roll platform technology the EFI VUTEk® h series printers built from the ground up to offer higher quality, more capabilities and better productivity up to 109 boards per hour. EFI‘s also launched industrial textile pigment ink technology for direct-to-textile production. The new EFI Reggiani pigment ink technology gives users a faster, environmentally friendly production process with inline polymerisation that requires less water, less energy and less processing time with no washing or steaming needed. In addition, the ink‘s excellent fastness properties and high printability sharpness will allow printing on a wide range of fabrics with the fine-detail designs. Other new innovations that the company came up with are EFI VUTEk FabriVU® 340i, an aqueous soft signage printer that combines superior-quality imaging with efficient, in-line fixation for fast, all-in-one fabric soft signage production. 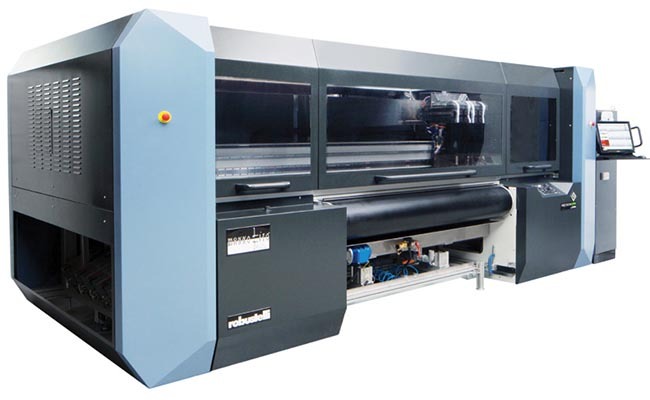 The new VUTEk h3 model offers maximum throughput of up to 74 boards per hour. The h5 model, which is available direct from EFI or as field upgrade to the h3 model, can produce up to 109 boards per hour. We are delighted that the industry reception of the TX801 has lived up to our high expectations, said Ghislain Segard, Marketing and Sales Manager, Textile Machine at Mouvent.“Industry experts have been impressed with the extremely high print quality at very high production speeds, as well as its precision and scalability. We are looking forward to demonstrating our technology in India, particularly so shortly after we announced a vital strategic partnership in the country.” Mouvent recently announced strategic partnerships with the principal distributors of textile printing solutions in four key countries, including India where the company will partner with Fortuna Colours & Prints LLP led by Vinod Krishnamurthy co-founders of Fortuna Colours & Prints LLP. It is a privilege to be partnering with Mouvent and we are very excited to help bring the TX801 to customers in India,” said Krishnamurthy. The TX801 uses a compact proprietary print engine based on Mouvent™ Cluster technology, and processes knitted, woven and non-woven textiles with a maximum fabric width of 1,820 mm, with roll diameters of up to 400 mm. It is the first printer to be launched by Mouvent, which has a full product pipeline of digital printers to be introduced in the months ahead. The benefits of using a digital textile machine is that you get a lot of variety in terms of colours for example 7-8 colours and also it is very time saving and yields faster results. My company has a production capacity of around 5000 pieces per month so I would choose a machine accordingly, i.e. a machine that renders high quality and high speed. The demand for digital printing in textile has gone high with growth of 60-70% while internationally it is around less say, 50-60%. Digital printing is definitely a growing segment and that is why we have already installed machines of high speed like that of EFI REGGIANI which can print high volumes in very less times. We have the capacity to print 8000 metres of fabric everyday and once we get settled with these volumes we will install more digital printing machines. Yes I surely think that DPT is beneficial for the textile industry as it growing at a rate of 35% in India while internationally it is growing faster with 65 %. Faster production, less complexity and precision in the outcome are some of the reasons driving demand. A machine should be medium in speed, high in quality, and moderate in volume capacity as for our company which has a monthly capacity of 45,000 pieces per month a machine with above mentioned points will be perfect. We can allocate around Rs 60- 80 lakhs for budget. See digital printing is still very expensive in India as compared to China. But it is much preferred because it does not cause pollution, moreover, the cost for it is becoming affordable and it is sustainable way of production also. We would be installing machine if the demand for digital printing goes up really high. The speed of the machines should be high and production should be above average. The demand internationally is very high and there has been an increase of around 90% . In India, the demand is surging by around 60-70%. See there are obviously a lot of benefits if a company has an in- house printing. One of the major reasons is that it helps in smooth and faster production as one does not have to depend on outsourcing. If there is a medium quality there will be medium demand and vice versa. If I am in the need for a machine in the near future I would look for a machine with average speed i.e printing of around 100 pieces per day. The demand is definitely growing at 10 % rate. See digital printing is the future of tomorrow. Everyone is going after digital printing these days and thus the demand is growing in India at a surprising rate of 30% while internationally it is 50%. As far as the quality is concerned it should cater to the high end market. My monthly production capacity is 2-5 lakhs meters per month and I would prefer a machine which is high in speed and gives extremely fine quality. This type of printing in India is growing at a fast pace. While in India the demand for DTP is growing at around 20% internationally it is high with 70% growth. I would consider a machine which is average in speed, high in volumes and gives extremely fine quality. The production capacity should be 10,000 garments in a day. There are several benefits of going digital. One is that it is sublime, second is that it is very functional and easy to use and thirdly it does not pollute. Speed, quality and capacity should not be very high or low but average. This sector is becoming competitive and hence it is growing. In India, the demand is 30-40% while internationally it is 50-60%. Yes I think that digital printing has a lot of benefits such as consistency, clarity in designs and fast delivery. There is no need to do screens as DTP is easy to use, and can do even small quantities. We are already using a machine by the brand Heidelberg. My production capacity is 2 lakhs pieces per month. The demand is comparatively more for digital printing in India. Yes digital printing is a beneficial technology as it has the ability to bring down the cost of production, is fast and easy to use. In the future if we go for installing a digital printing machine it should have a high speed and quality has to be extremely fine. The demand for digital printing is going up by 70%. In India, the digital printing market is seeing around 30% growth. The larger the production, higher should be the speed, so we would obviously require a machine that can churn high volumes. Digital printing is definitely a better option because of the price and quality and that is why it is witnessing a high demand from the market. We have a production of 20,000 to 50,000, garments per month so the speed that we are looking at will be not very high but average. 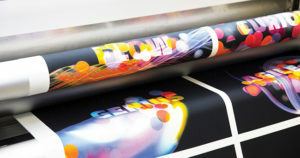 The demand for digital printing is going up internationally and we can say that there is a growth of around 35 to 40%. I can’t say about India but I can definitely see a good growth in the near future. It is good and widely acceptable. It is beneficial because it can save money, time and energy. It is quite fast also and the prints are very bright. The best part is there is no limitation on designs. Apart from this digital printing comes at a better price and high speed as compared to screen printing. As far as our plan to install a machine is considered we would look for machine which has good quality and has volumes like that of a rotary printer which yields better results. The demand internationally is 60%, while in India it is 40-60%. We would opt for a higher capacity machine.